I have some imaginative ideas for teaching our children the spiritual lessons of Lent and Easter, but they involve rocks instead of cute bunnies or painted eggs, so please put on your creativity cap before reading further. During Lent, church sanctuaries everywhere are xeriscaped with dusty, dull-colored sand and rocks among other dehydrated things. These are fitting reminders of the New Testament event in which we find the origins of the season of Lent: Jesus’ 40, arduous days of fasting and doing spiritual battle with Satan in the desert (Matthew 4:1-11). One year, however, I really wanted my children to experience the beauty of Lent, not just the austerity of it, so I began decorating our house with rocks that were quite a bit more colorful than those used at church. By decorating with colorful rocks, I set out to visually disprove the misnomer that Lent is all dreary and dull. Really, who could look at the deep purple crystals of an amethyst and think that all rocks are dull? The fact is that, as with amethyst crystals formed inside a geode, the magnificence of Lent is usually not obvious to a casual observer. Rightly done, however, the practices of Lent — fasting, praying, and almsgiving — do not become austere penances done for their own sakes, but tools to crack open the meaning of Lent, which is the magnificence of having a right relationship with our Heavenly Father, a relationship which should be the crowning jewel of all our desires. Something else to consider is that a geode begins as an empty cavity within a larger rock mass. Over time and by remaining still, interior mineral deposition occurs in the empty cavity resulting in the growth of beautiful crystals. Similarly, Lent invites us to empty our hearts of our own wants and needs through fasting and almsgiving. It further invites us to spend more time being quiet before God in prayer, resulting in the space, the time, and the stillness we need to grow in our hearts that crowning jewel of a right and beautiful relationship with God. Like geodes, rocks containing fossil plants and animals can also be fantastic object lessons for Lent and for Easter. Keep your creativity caps on and consider this. The reigning symbols of Easter are the Easter egg and the Easter Bunny. Both are pagan fertility symbols from antiquity co-opted by early Christians. Lent and Easter, however, are not so much about fertility, as about death and resurrection, so both eggs and rabbits actually miss the mark. However, what if a plant or animal that had died, been fossilized, and entombed in a rock was to come back to life? Now that would be an indisputable, spot-on symbol of Lent and Easter! Consider, also, that the first thing Satan tempted Jesus to do after Jesus had been fasting in the desert for 40 days was to turn stones into bread (Matthew 4:3). Satan uses stones as a symbol of death and bread as a symbol of life revealing by his very temptation, that he knows that Jesus has the power to resurrect anything. Do we have as much faith in Jesus’ power as Satan has? Could we look at a fossil in a stone and really, truly believe that Jesus has the power to bring it back to life? The Bible is chock-full of stories telling us that God has the power to resurrect that which is dead; Lazarus, for example, Jairus’s daughter, dry bones in the desert, stones, and finally, Jesus himself. Fossil rocks can help young and old alike really see, understand, and believe this, the most important lesson of the entire Liturgical year. I don’t think geodes or fossils will actually replace dull-colored rocks, eggs, or bunnies as Lent and Easter symbols any time soon. 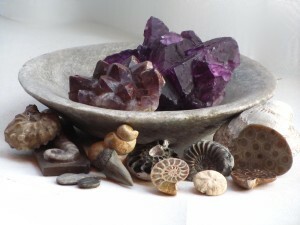 If we keep our creativity caps on, however, and maybe incorporate an amethyst geode into our Lenten displays (purple is the Liturgical color of Lent) or tuck amethyst jewelry or a fossil under the chocolate bunny in our Easter baskets, we can have a little fun in using both liturgical seasons to spark our children’s Christian imaginations and their appreciation for God’s boundless love, power, and creativity. Heidi Bratton is amazed to have found her niche as a wife and home-schooling mother of six children ranging in age from 3- to -21- years old, the author of 15 Christian children’s books, a Catholic newspaper columnist, speaker, and a professional photographer all at once. She’s not amazed to be in constant need of an uninterrupted nap! Heidi’s newest book, Homegrown Faith; Nurturing Your Catholic Family, is dedicated to helping families grow in faith right at home and is a perfect companion to her also newly published children’s board books, the Celebrate series. Visit Heidi on her website: www.heidibratton.com.